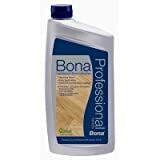 Bona Pro Series Hardwood Floor Refresher provides a clear, highly durable gloss to polyurethane-finished wood floors that are dull, worn, scratched, or show signs of wear. This non-toxic, waterborne formula restores beauty to wood floors, leaves no build-up, and is recoatable. For best results, use with the Bona Pro Series Microfiber Applicator Pad. One 32-ounce bottle covers approximately 500-square feet.